Snacking. It is one of the things I think I do best. I am one of those people who pretty much runs on food every three hours. From what I am aware, this is a good thing. It’s good for your energy and metabolism so fueling up on a regular basis is in your best interest. 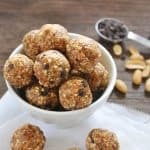 If you have been around here long enough, then you know that energy bites, granola bars and no bake snacks are one of my fortes. I was certain I had thought of every combination there was out there and that I couldn’t possibly top some of my other favorites…until now. 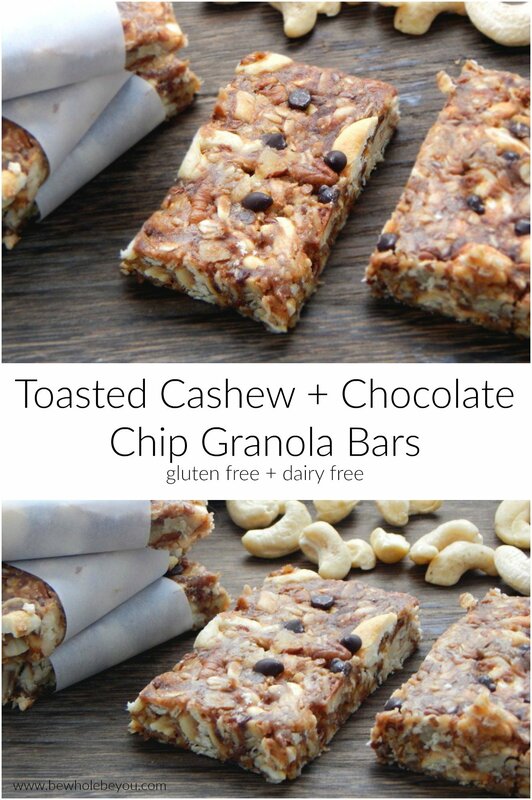 These Toasted Cashew + Chocolate Chip Granola Bars are the perfect snack for when you are in need of a midday energy boost. Not only that, they are also an option for a quick breakfast when you are on the go. They are a great addition to anyone’s lunchbox as well! They are the perfect chewy treat with a hint of sweet and a touch of salty. My favorite combo! Cashews have been my go-to nut of choice and for more reasons than just the taste these days. When you toast them in the oven for a few minutes, the flavor is just right. 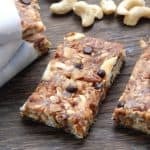 You can make these Toasted Cashew Granola Bars with raw nuts, but I definitely recommend taking the extra time if you have it. Now, cashew butter is not cheap. Making your own is always a great idea. It is just a matter of processing them or putting them in your high powered blender until the oils release and a smooth butter is formed. 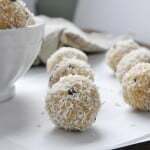 In a food processor, it takes a good 20 minutes of stop and go, but the amount you get homemade versus the amount you would buy at the store is definitely much more cost effective. You could also swap the cashew butter for your favorite nut or seed butter, but I think the cashew butter is really what makes this recipe in then end so if you have the option, use it! Toast cashews and pecans about 7-10 minutes at 350°F or until a light golden brown. In a food processor, process dates until thick and paste like. Transfer dates to mixing bowl. In food processor pulse to chop cashews and pecans. In sauce pan melt cashew butter, maple, and vanilla on low until combined and smooth. Combine all other ingredients in mixing bowl with dates and then add nuts and cashew butter mixture. Stir to combine. Chill for about one hour before cutting.